We developed our rankings by focusing on what is increasingly most important for universities and faculty: publication in top tier economics journals. While most rankings are based on lifetime citations, faculty tenure and promotion decisions and university budget dollars are increasingly driven by the number of publication in top journals in recent years. Our system rewards the most currently productive researchers and identifies whom is most likely to be a top citation ranking in the future. We thus developed a ranking system based purely on the number of publications economics faculty have had over the previous four years in the five top economics journals. We identified every publication in five top economics journals published in 2014, 2015, 2016, and 2017. We identified the five top economics journals from the Journal Citation Reports’ journal impact score and chose the five economics journals with the highest impact score. To confirm use of these journals in tenure and promotion evaluations, we also reviewed the journal lists used in multiple University Economics Departments to evaluate faculty productivity, tenure, and promotion. The five journals used for our 2018 Top Economics Professor ranking were Econometrica, Journal of Economic Literature, Journal of Economics, Journal of Political Economy, and The Quarterly Journal of Economics. Our analysis found there were 1,323 economists that published articles in these five journals between 2014 and 2017. Of these 1,323 authors, just 172 economists had two or more top tier journal publications, and only 39 had three or more publications. Of the most productive economics professors, nine published four article and only two professors: Daron Acemoglu of the Massachusetts Institute of Technology and Xavier Gabiax of Harvard University had five publications. Because first authors are generally recognized as having provided a greater intellectual contribution to the journal article, we examined the number of first author publications versus publications where the author was second or higher in the list of authors. 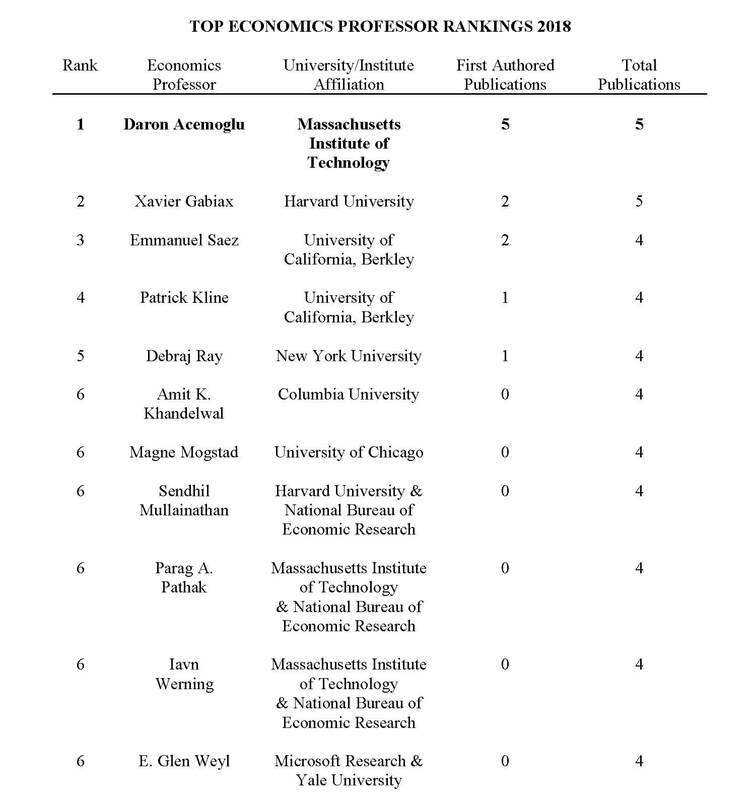 We used this number as tie breaker between the top two published economics journal authors and recognized Professor Acemoglu with five first authored publications the Top Economics Professor of 2018. Professor had two first authored journal article publications. Data & Sons was co-founded by a university professor and serial entrepreneur who thought there had to be a more equitable and easy way to exchange data. Data & Sons is the world’s first open dataset marketplace. We enable people to buy, sell, and share any list, spreadsheet, table, or just about any imaginable kind of organized information. People use Data & Sons for exchanging business, government, science, and education datasets. University faculty use Data & Sons to distribute, manage, and sell datasets to their students for use in business, data analytics, statistics, econometrics, and mathematics courses. For complete ranking of economics professors, please click here.